You’re a busy person - too many things to do during the day and too many people taking your attention. It’s easy to lose focus on the priorities that matter to you most. Each week, Focus On 5 will ask you to reflect on what matters to you and to define 5 priorities to accomplish for the week. 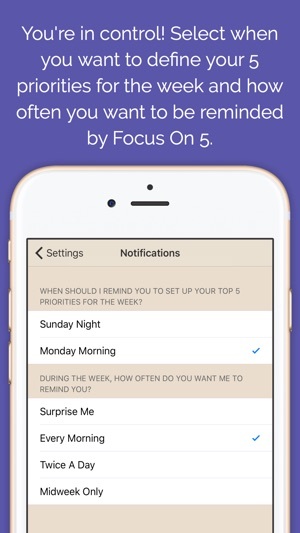 During the week, Focus On 5 will gently remind you of your priorities, and then you can review and accomplish them on your iPhone and Apple Watch. 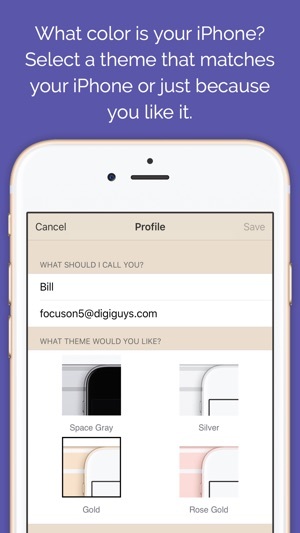 Email us at focuson5@digiguys.com for any support questions or suggestions. Q: Why does Focus On 5 focus on priorities? A: Focus On 5 is based on a weekly cycle. Life goals take longer than one week to achieve, and tasks are too numerous, changeable, and distracting. Priorities are what matter to you the most each week. Q: Is Focus On 5 a to-do list? 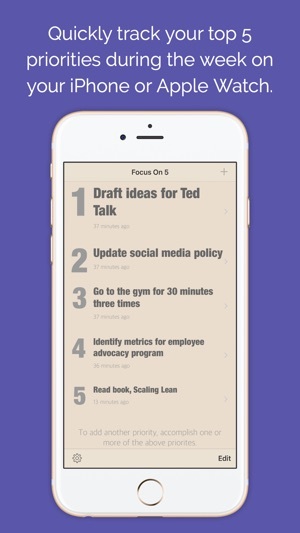 A: No, Focus On 5 is not a to-do list, task tracker, or time manager. Focus On 5 priorities are bigger than tasks and help you align your efforts with what matters to you most. Q: Why only 5 priorities? A: Having 5 priorities for the week makes it easier to focus on what matters to you most. 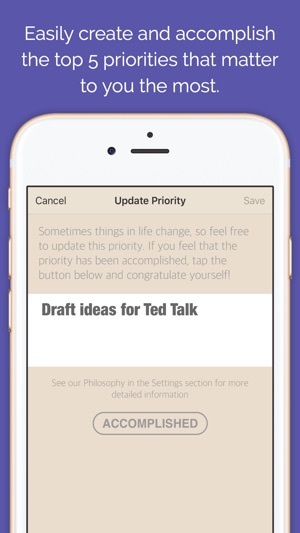 5 is a manageable number of priorities, and you can see them all at once on your iPhone screen. Q: How big is a priority? A: Priorities are larger than tasks and smaller than life goals. Define priorities that you could reasonably accomplish in a week with some effort. Be bold. There’s no time like the present! Q: Does Focus On 5 work with my Apple Watch? A: Yes, you can review and accomplish your priorities using your Apple Watch. Thank you for your feedback. 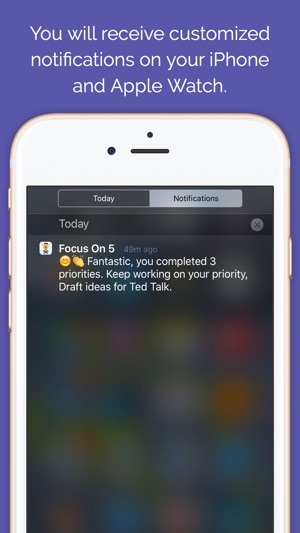 It's great to see that Focus On 5 is helping you accomplish your weekly priorities! If you like Focus On 5, please leave us a nice review, it really helps! 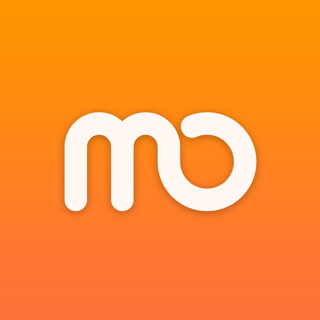 + Added Frequently Asked Questions (FAQ) section to answer your most common questions. + Made a few adjustments for the iPhone 5s screen size. + Updated our icon making Focus On 5 much easier to find. + Plus some additional minor improvements. 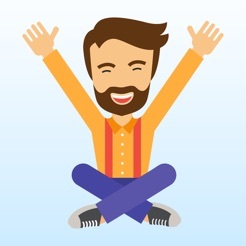 Join our Facebook Page for tips, ideas, support, or to share your success stories... be part of the community!